We recently received this wonderful review from guests who have stayed at Nancenoy in Port Navas on the Helford River. It really is great to hear how you enjoy our wonderful county, which places you visit and sights you see, do please keep your reviews coming! My partner and I found this cottage idyllic with its up side down living room and bed room. The cottage is beautifully fitted out and the bed and bedroom are bliss, very comfortable and you do get a great nights sleep. The log burner is superb at night for chilling in front of and everything is to close to hand. The cottage is based in the very quiet place of Port Navas but very central to Falmouth and other parts of the Cornish Coast. All in all a great time and definitely Cornwall is now in our hearts. We'd like to thank the Todd family for their wonderful comments, many thanks for sharing your favourite places. 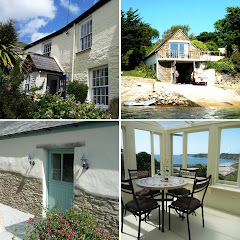 For more information on staying at Nancenoy or her sister property Polwheveral, please visit CornwallsCottages.co.uk. We look forward to welcoming you all to Cornwall soon!